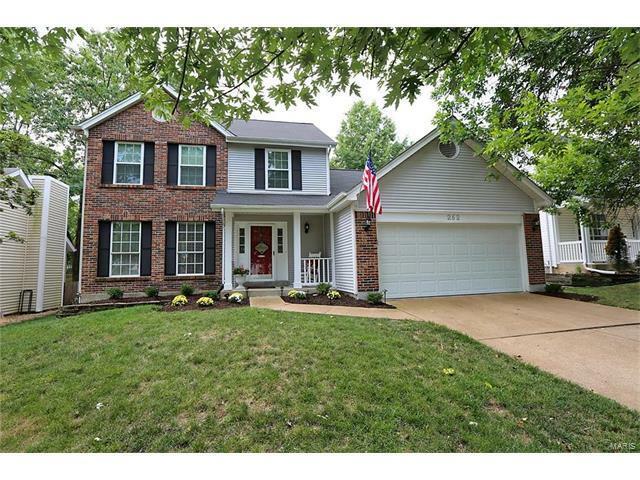 Charming 2 story on pretty tree-lined street in heart of Ballwin. Beautiful brick elevation. Impeccably maintained. Shows like a display. Wood floors in entry, powder room , kitchen and breakfast room. Living room and dining room have wainscoating and crown molding. Kitchen updated with glass back splash, Quartz counter tops & stainless appliances. Pretty bay window in breakfast room opens to large, expansive deck. Kitchen opens to large family room, newer carpet, bay window, cathedral ceiling. Master bedroom suite light & bright. Two additional bedrooms on 2nd floor. Lower level with large family room, office area, full bath and additional storage. New windows on 2nd level 2016. Newer roof and furnace in 2015. Minutes to shopping, grocery stores and Bluebird Park. Great home...won't last long! Manchester to South on Reinke to Right on Oakwood Farms Drive to Oakbriar Farms Drive to house on left.